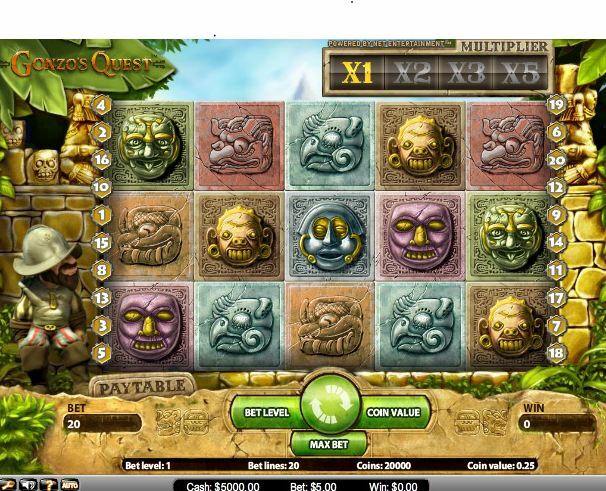 Net Entertainment is known for sophisticated online slots, and Gonzo’s Quest is no exception. 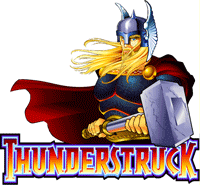 This game was built exclusively for online casinos, and features top of the range computer graphics for a slot. There are no land-casino versions, nor deluxe versions of the game. Gonzo’s Quest will almost instantly grab players’ attention, due to the attractive style of presentation and alluring payout. A multitude of combinations exist, and there are a variety of bonuses to give players a higher chance of winning. The slot begins with an intro movie, showing Gonzo the explorer hunting for treasures in the mysterious lands of Peru. The graphics are quite cartoony, reminiscent of modern flash titles, and it is quite an immersive experience for a casino slot. 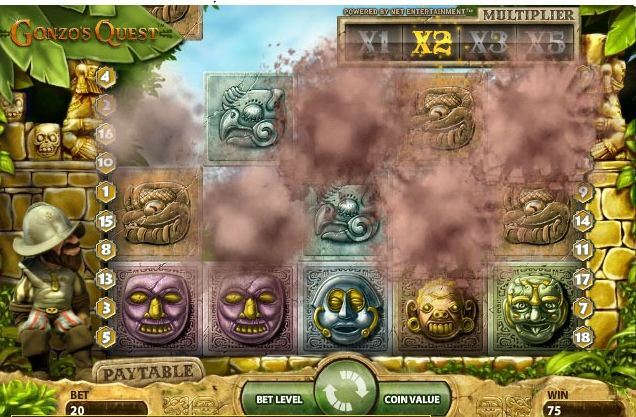 The 3D graphics are crisp and detailed, with the icons representing various Aztec symbols etched in stone. The interface conveys the ambience of the Peruvian rainforest, with Gonzo standing on the left-hand side. The slot shows the paylines on the side, multipliers at the top, and all the other essential info at the bottom. 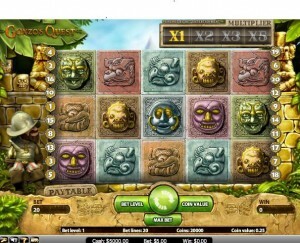 Gonso’s Quest is a 5-reel, 3-row slot machine with no reel spin. Unique to Netent, the symbols “fall into position” in the reels, instead of spinning. The game is played with 20 fixed paylines. Gonso’s quest features a Question-Mark wild symbol, which can substitute for all other symbols to create a winning combination. There are no scatters, nor nudge or hold features, and other winning combinations include the standard 3,4,5 symbols matching. 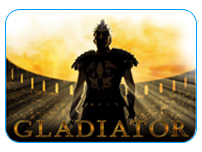 Players can choose to use the Autoplay and Max bet features. The number of lines are fixed in this slot, though you can still choose the bet-per-line with the Coin Value button. You can bet a minimum of £0.01 and maximum of £0.50 per pay line, with 1 to 5 coins for each payline bet. Maximum bet per spin is £50. Avalanche – this exciting bonus features really gives players a chance of additional wins. Any winning combination starts an Avalanche. The wining symbols of the initial Avalanche explode and disappear, then a second Avalanche of symbols starts and new symbols fall into the empty spaces. The Avalanches continue for as long as wining combinations are formed. 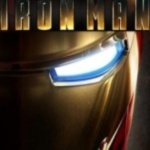 Free Fall – three Free Fall symbols, appearing in sucesstion from left to right, will win you 10 Free Falls. Free Falls use the same bet as the round activating Free Fall. In addition, a winning bet line during Free Fall will trigger an Avalanche. Additional Free Falls can be won during Free Falls. Multipliers – Gonzo’s quest offers a unique multiplier, in which the win multiplier increases with every win, until it reaches the maximum multiplier. The maximum multiplier remains in place until a no-win spin is played. The maximum multiplier in the basic game is x5 and in the Free Fall spin the maximum multiplier is x15! Gonzo’s quest has a theoretical RTP of 96%, and it does not feature a progressive jackpot. The highest win for this slot is 2,500 coins, which gives players a nice incentive. Some casinos report the maximum payout as 6,000 coins, but do check before you play. Overall, this slot offers a nice polished game with nice 3D computer graphics. It is not recommended for beginners.